For those looking at escorted tours of Japan, trying the cuisine is just as important as seeing all the tourist sites. 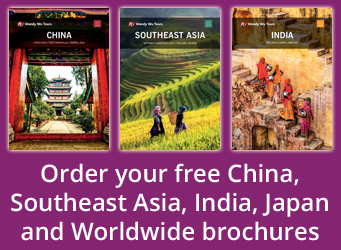 Only then can you fully immerse yourself in the culture of the Japanese. From standing restaurants to sushi belt restaurants, noodle bars to vending machine eateries, here is a list of five of the top dishes to try in Japan! 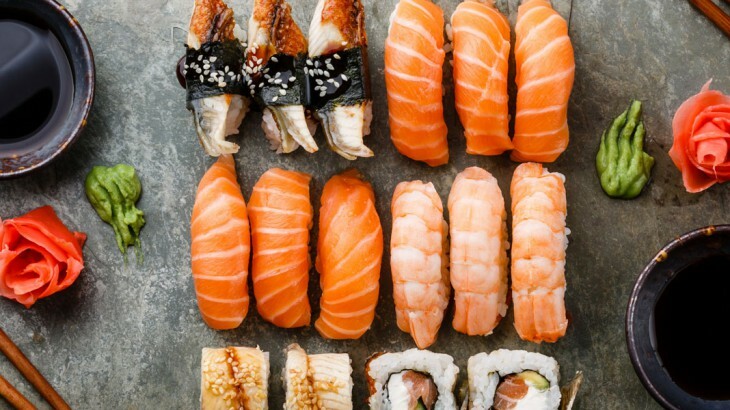 You’ll eat the freshest sushi you’ve ever tasted in Japan. Surrounded by rich waters, most of Japan’s fish is caught and eaten on the same day. The famous Tsukiji Fish Market in Tokyo is world famous for its daily catch, producing top grade sushi and sashimi for the city’s restaurants. 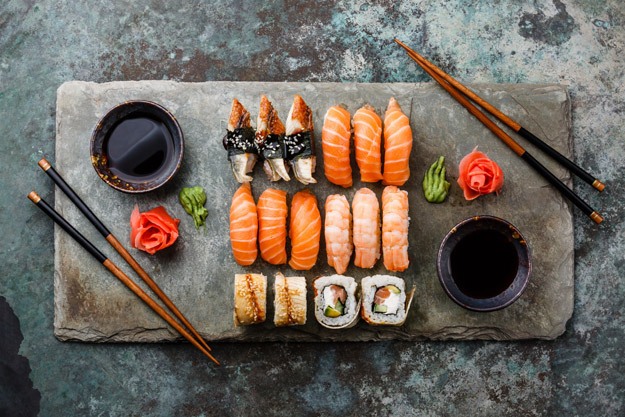 You could opt to eat sushi at a top end restaurant or choose a conveyor belt establishment, where you pay per plate. Whichever you choose, it will taste delicious. Free green tea always compliments the meal. For a delicious, affordable sushi meal, check out Musashi Sushi conveyor belt restaurant in Kyoto (which we recently featured as one of the best places to eat sushi in Japan) where plates are only 140¥ each! You could eat a full meal for under £15 per person. Tonkatsu does not feature widely in Japanese restaurants outside of Japan; and we’re not sure why as it’s delicious! Second to fish, pork is a favourite meat of the Japanese. 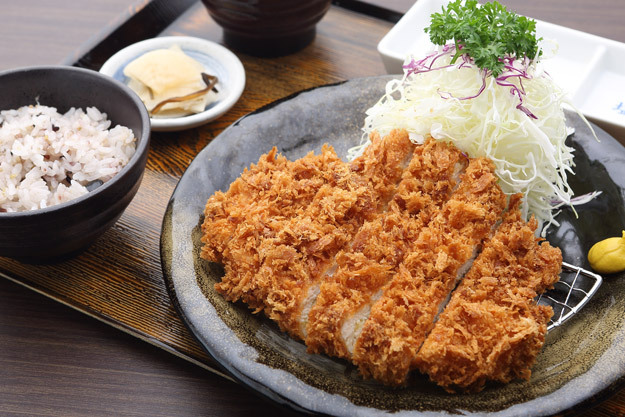 Tonkatsu is a thick pork chop coated in crunchy panko breadcrumbs and deep fried. It’s traditionally served with shredded cabbage, rice and a special Tonkatsu sauce, which has a BBQ-like taste. Depending on the restaurant, you can usually choose the cut and weight of the pork as well. Katsukura is a chain of Tonkatsu restaurants around Japan that offers an excellent introduction into the world of Tonkatsu! You can find branches in Kyoto, Tokyo and Osaka. Ramen is popular the world over, but only in Japan does it taste truly delicious. It’s probably our favourite of our five dishes to try in Japan. It consists of ramen noodles, numerous vegetables and pork strips in a bowl of steaming pork or miso broth. It’s garnished with an abundance of garlic, chilli and a tea-stained egg. 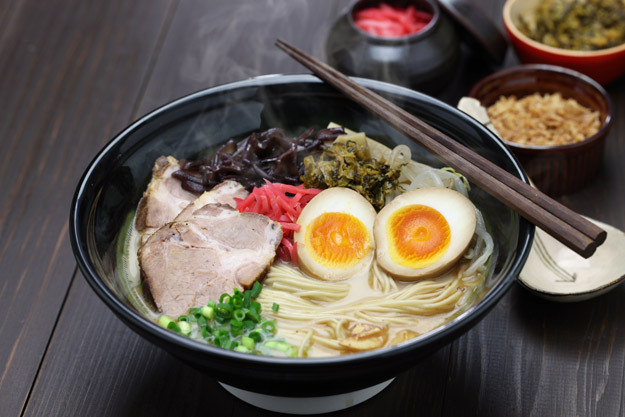 Most authentic ramen bars will operate using a traditional vending machine, where you can use the pictorial buttons to decide what type and size of ramen you would like, as well as whether you want a tea-stained egg in it or not. Once you’ve paid and received your token, you are seated inside in little individual booths where a waiter will hand you a piece of paper where you can choose the thickness of noodle, the level of spiciness, how much garlic you want and whether you would like extra meat. Your ramen is then served promptly according to your specifications. Slurp it all up – it’s rude not to in Japan! Ichiran is a chain restaurant with yummy ramen for a very decent price. Found all over Japan, try the vending machine ordering for yourself and sink into true Japanese food culture. Anything deep-friend is tasty; and tempura is no different. Many eateries offer donburi bowls, which are bowls of rice with meat, vegetables and an egg placed on top. 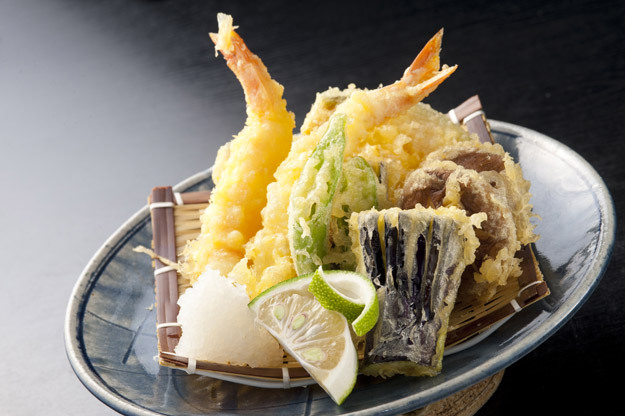 Most will offer a tempura version, where prawns or vegetables are deep fried in special tempura batter and placed on top of the rice. Alternatively, there are some restaurants which specialise in tempura as their main offering. Tempura Tsunahachi in Shinjuku, Tokyo, offers the quintessential tempura dining experience. Watch as talented chefs offer you course after course of authentic tempura meat, fish and vegetables that are very crispy and not greasy in the slightest! If your purse doesn’t reach that deep or you’re looking for a quick lunch stop, there are many tempura buffet restaurants in every city, where you can pay per piece of tempura. It works out to be very affordable! A speciality of the cities of Osaka and Hiroshima, Okonomiyaki is a must try in either city… or both, as the cooking methods differ! It’s a savoury pancake consisting of flour, yam, eggs and shredded cabbage for the base, and different meats, seafood, vegetables or noodles for the topping. It’s finished off with mayonnaise, special Okonomiyaki sauce, seaweed powder and bonito fish flakes. It’s a shared experience between the chef and the customer as it is cooked in front of you on a flat grill. Best of all, it tastes delicious! If you’re in Osaka, all the ingredients – both the base and toppings – are mixed together before being cooked. In Hiroshima, the ingredients are layered for a unique eating sensation. 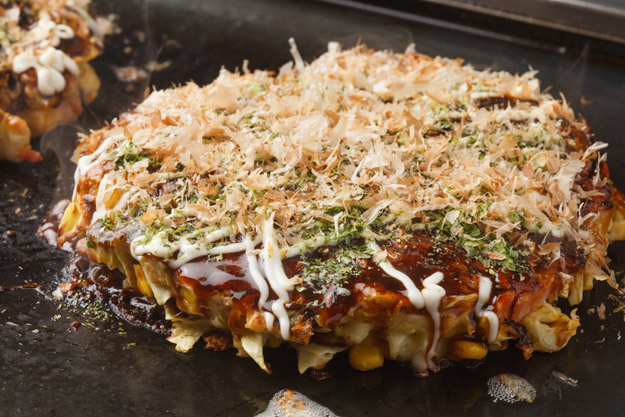 The best place for Okonomiyaki in Osaka is Mizuno, located in the Dotonbori area of the city. There are always queues outside but it’s worth the wait! Japan food and drink. permalink.